Jigen and Goemon arrive at the Ponte de Terre-Neuve bridge so that Goemon can rescue Lupin. The trio then escape as a female assassin with tattoos, piercings, and other body modifications attacks Albert. Albert manages to fend off the woman, named Chlo, but has the black book stolen by Chlo’s accomplice. Albert escapes while Jose forbids Chlo from pursuing since they have what they came for. 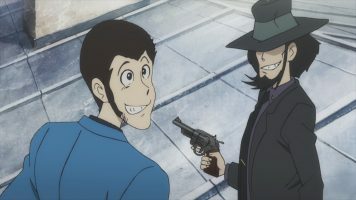 Meanwhile, Jigen and Goemon set up a hideout in the sewers for Lupin to recover, where he has a memory dream about Albert beating him to a bank robbery. In an old, abandoned castle, Jose watches the news of the upcoming election. The injured, Carmen Sandiego-looking Revenant arrives. 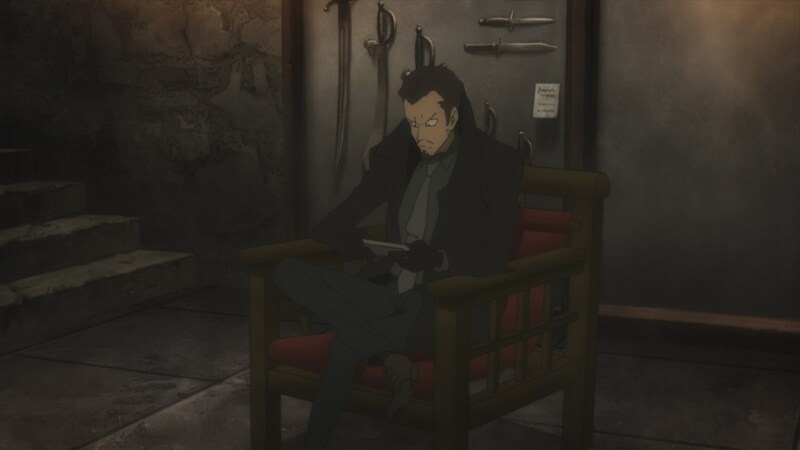 However, Jose punishes Revenant because the assassin failed to kill Lupin and retrieve the black book. Back at their sewer hideout, Lupin recounts to Jigen and Goemon how he and Albert had been partners in crime. Albert grew weary of the small capers they engaged in. As such, he parted company with Lupin, having the goal of stealing France for himself. Elsewhere, Albert gets a report on Guillaume’s activities while Guillaume gets a call from Jose. He has teamed up with one of the French presidential candidates and as such, won’t be turning the black book over to Guillaume. Further, he forces Guillaume to allow a terrorist group into France to bomb buildings and thus give Jose’s candidate a platform on which to win the election. Albert is stunned that Guillaume is allowing the terrorism. Lupin and company return to their normal hideout, only to have it come under assault from an armed force. The trio are forced to retreat, but encounter Revenant. Goemon decides to deal with her (?) 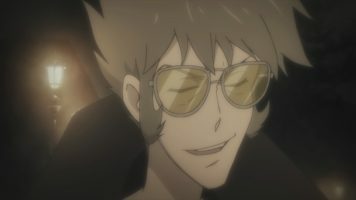 while Jigen and Lupin move on. They encounter Chlo and her partner with the kunai-like weapons. The pair retreat to skyscraper under construction and after a fight, manage to get away. The trio return to their sewer hideout to regroup and plan. Meanwhile, Albert is unhappy about how things are going. Elsewhere, Jose speaks with his presidential candidate on making a final push for the election. All of this has the government paralyzed as no one wants to act while the black book is still in play. That night, Albert has a memory-dream about an African caper with Lupin and decides to make his move on Guillaume. When he arrives at Guillaume’s place, Lupin is waiting for him, having secured Guillaume. 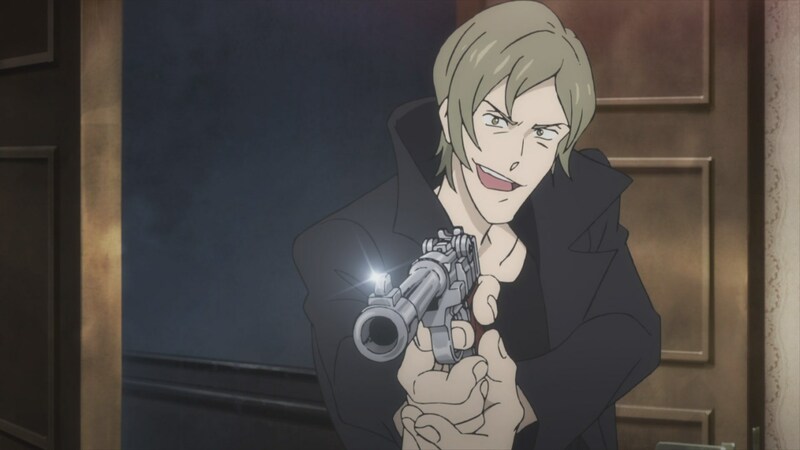 Lupin and Albert come to a trues so Albert can interrogate Guillaume. After last episode’s twist, Lupin the Third Part 5 – 09 certainly had me more interested in the current story arc than I had been before. 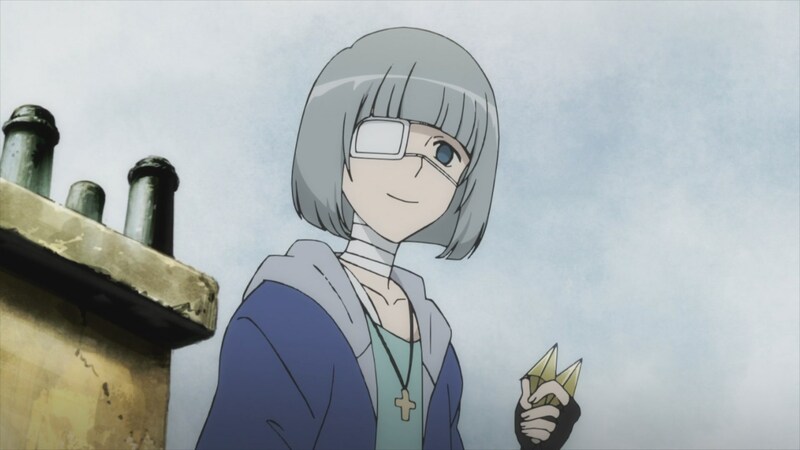 The political aspects of the episode weren’t things I found that interesting. Things seemed pretty cliched with the notion that those in charge of the country were more interested in staying in power than anything else. Typical politician. 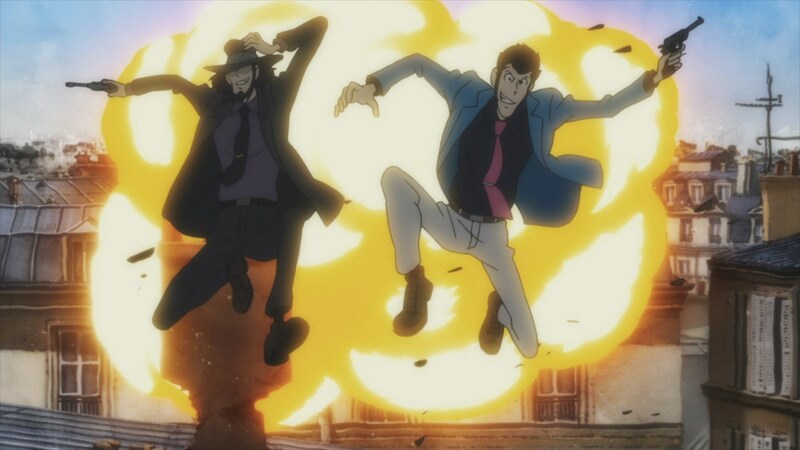 Part of the fun of the Lupin III franchise is the tongue-in-cheek way they ignore physics at times. 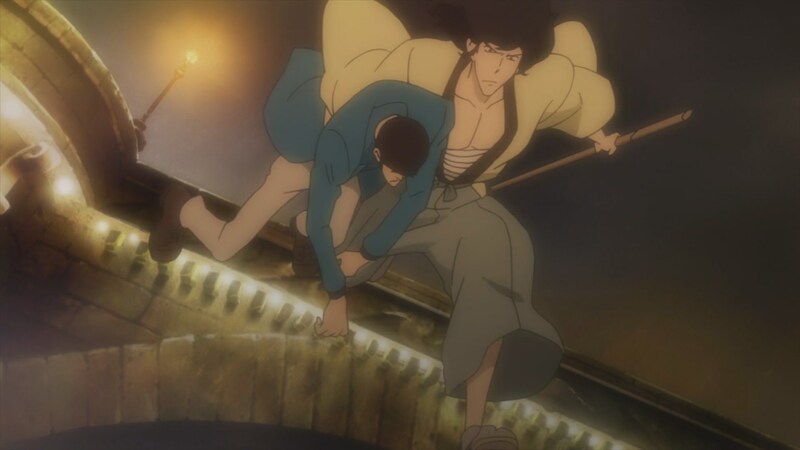 I’m leaving Goemon’s feats out of this because he’s the cliched samurai (or ninja) warrior who can do extraordinary things. 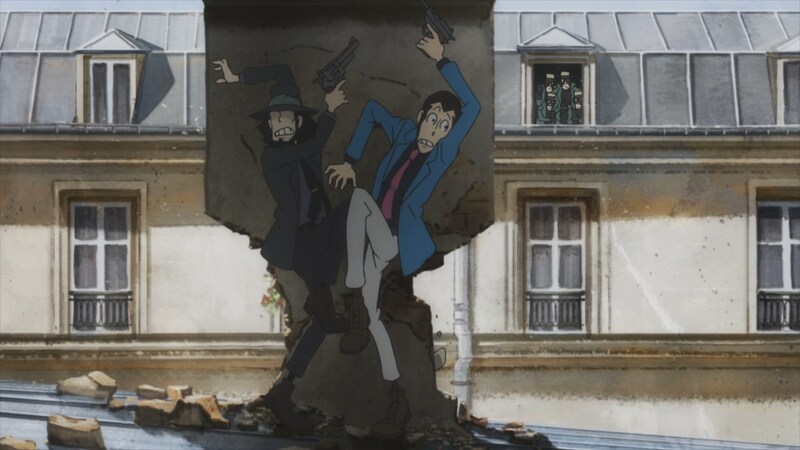 As such, when Lupin and Jigen leapt out of their rooms to escape, it was very much a Lupin Physics moment. Likewise, when the pair had their motorcycle leap over what I presume is the River Seine. I admit, I kinda like those silly moments. 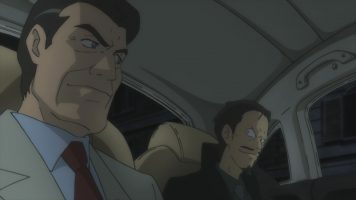 Although Lupin the Third Part 5 – 09 had a serious undertone, some of the lighthearted comedy elements that is often in the Lupin III franchise also returned. As such, we saw moments of levity, such as when both Goemon and Jigen crack jokes about Lupin apologizing to them. Lupin and Jigen have fun making their escape from their room, even though they are under attack from a group of armed folks. I liked these moments as well. Nods to Castle of Cagliostro and more? One thing that I noticed was that there seemed to be subtle nods to the Lupin III: Castle of Cagliostro movie. For a start, when Lupin gets shot and rescued, there’s about three days that he sleeps. His bandages here are similar to how they were in the movie. And he eats food, though he doesn’t gorge himself as he did in the movie. 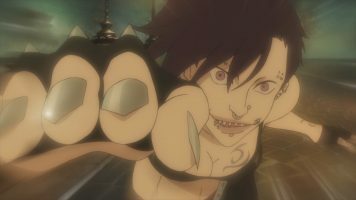 Then, there’s the Chlo assassin, who’s body modifications give her nails a metal structure. As such, her attacks with them reminded me of the metal claws used by Jodo’s (or Jodot’s, and the renaming has gone) troops. 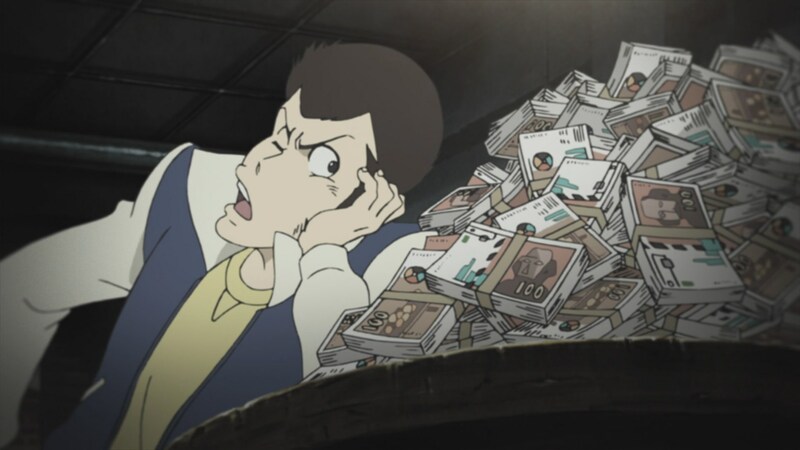 There’s the piles if counterfeit money aspect, which again reminded me of Castle of Cagliostro. 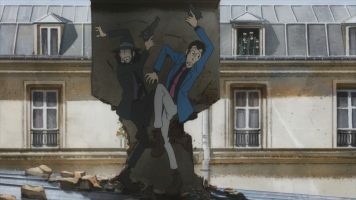 And of course, Lupin and Jigen’s escape from their room reminded me of Castle of Cagliostro. 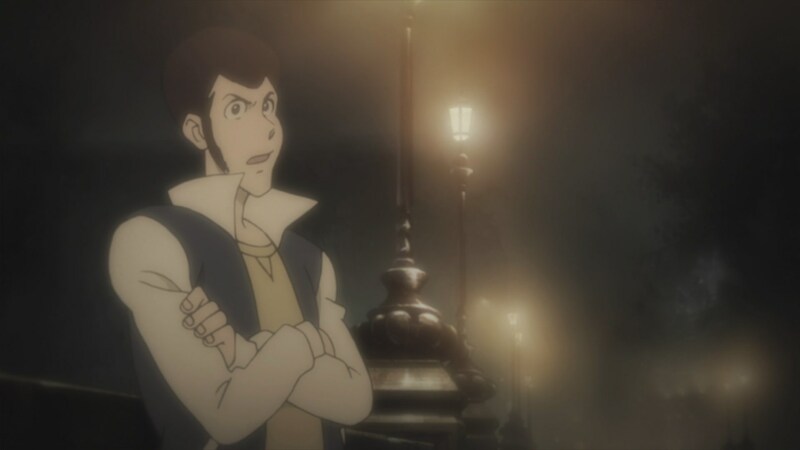 Finally, in one of the flashback sequences, Lupin mentioned that if Albert quits, he’s taking the “III” title to become Lupin III. This seemed like a possible nod to the Lupin III: Green vs Red OVA episode. 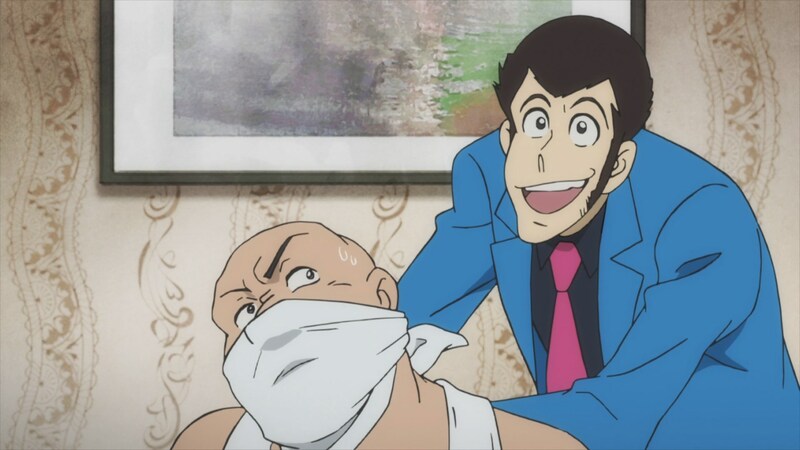 There, it is strongly implied that the name Lupin III is like a title, passed from person to person over the years. 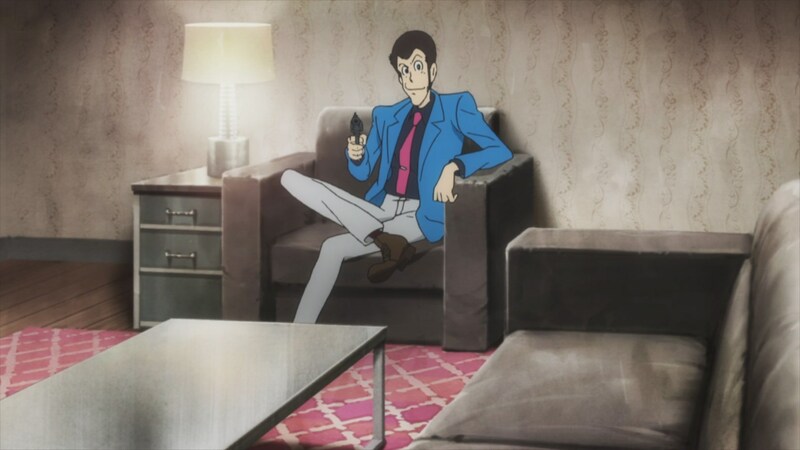 Unfortunately, Lupin the Third Part 5 – 09 does not bother to explore this any further. 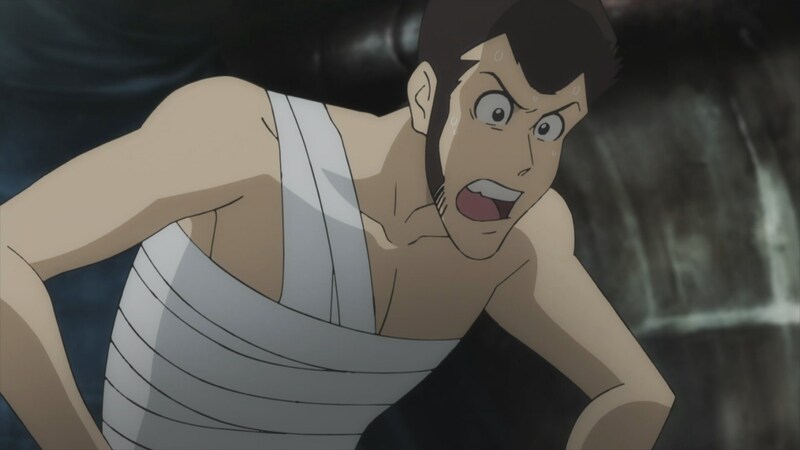 OK, I need to wrap up my review of Lupin the Third Part 5 – 09. As I thought, the Carmen Sandiego-looking Revenant wasn’t dead. I really wish we had a Rebecca or Ami. Alas, we don’t. Still no Fujiko, and Zenigata hasn’t even been referenced at all this arc. We’ll see if this truce between Albert and Lupin reveals any further information. In the end, Lupin the Third Part 5 – 09 ended up being more interesting and fun than I expected, despite my not being interested in the political aspects. I’m interested in seeing where this will go. This is probably my favorite episode in this story arc. A surprising number of things happen in it and there’s some real interesting action and plot developments. Too bad it all amounts to very little because the conclusion in the next episode doesn’t live up to the expectations, in my opinion. Ugh oh. Well, I’m bracing myself for when I get to watch the next episode.